UniCredit and UEFA have teamed up to create an incredible UEFA Champions League Trophy Tour that will span (5) European cities from September 15th through October 17th. The tour features the UEFA Trophy traveling in a glass case on a bed of a semi for all onlookers to see. The UniCredit UEFA Champions League Trophy Tour allows fans to have their picture taken with European soccer's most prized possession, experience a meet-n-greet with famous players, and enjoy plenty of soccer activities. In 2009, the trophy tour attracted 90,000+ fans. 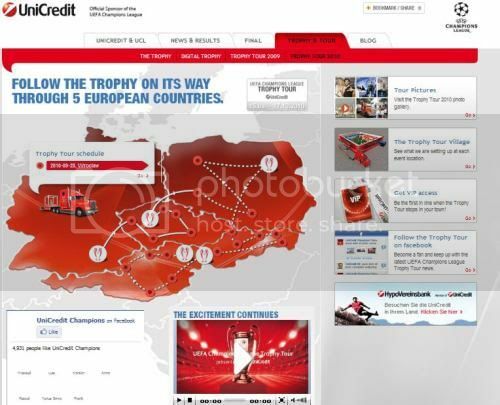 The 2010 UniCredit UEFA Champions League Trophy Tour will travel to Munich, Prague, Warsaw, Bratislava, and Vienna. The tour vehicle will also make stopovers in various cities en route to each of the destinations, allowing soccer enthusiasts throughout Europe to see the trophy. UEFA will use the tour to promote its services, key values, and fair play. One of the most impressive aspects of the tour (outside of the semi display), is the tour's interactive webpage, which is definitely worth a look.